Mr. Vince Finnianous (pronounced Fin-Yon-Us) is a fourth-degree black belt in Tang Soo Do. He started martial arts when he was a teenager in the 70’s. Mr. Finnianous’ interests and activities have always included gymnastiscs, rock climbing and running. He is also a licensed general contractor by day. Mr. Finnianous completed college in 1972 and moved to Klamath Falls in 1980. He earned his first-degree black belt in 1996. After struggling with more costly student fees and philosophical differences with his Korean federation, he joined AIKIA (American Independent Karate Instructors Association). AIKIA allows Mr. Finnianous to combine other arts into his system while keeping costs for students down. 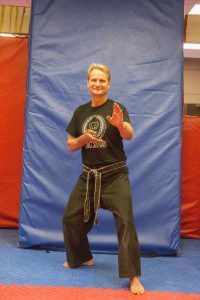 Mr. Finnianous has been instructing steadily in Tang Soo Do since 1995 and also continues to cross-train with other systems. He also does extensive self-study in the martial arts and his own personal and business life.